To Cite: Fa L, Shao G, Meng L, Wang L. Reliability of a New Radiological Parameter Named the Modified Tönnis Angle for the Evaluation of Acetabular Dysplasia in Adults, Iran J Radiol. 2018 ; 15(2):e17163. doi: 10.5812/iranjradiol.17163. Objectives: To evaluate the reliability of Tönnis angle and modified Tönnis angle on pelvic radiographs in adults. Patients and Methods: Conventional anterior-posterior pelvic radiographs of patients were selected from the picture archiving communication system (PACS) in the department of medical radiology of the Second Hospital of Shandong University. Tönnis angle and modified Tönnis angle were measured. All measurements were performed by two experienced observers who worked independently of each other. These measurements were performed again after one month. They were performed digitally using tools of the PACS. Reliability of Tönnis angle and modified Tönnis angle was assessed by intraclass correlation coefficients and Bland-Altman plot. Results: A total of 142 patients (79 females and 63 males) with 284 hips were selected. Tönnis angle and modified Tönnis angle were measured on the 284 hips by two observers. Intraclass correlation coefficients (ICCs) for intraobserver agreement of measurements were 0.962 and 0.983 for Tönnis angle, and 0.971 and 0.984 for modified Tönnis angle. ICCs for interobserver agreement of measurements were 0.936 for Tönnis angle and 0.932 for modified Tönnis angle. Bland-Altman plot suggested good interobserver agreement of measurements for Tönnis angle and modified Tönnis angle. Conclusion: Reliability of Tönnis angle and modified Tönnis angle was good according to ICCs and the Bland-Altman plot. Adult acetabular dysplasia appears as a shallow acetabular roof and a small weight-bearing area (1). A shallow acetabular roof may lead to subluxation of the hip, and even a completely dislocated “high-riding” hip. Weight-bearing forces distributed over a smaller area of an acetabular roof can easily damage the articular cartilage and subchondral bone. Acetabular dysplasia is recognized as a major risk factor of osteoarthritis in young adults (2-4), and adult acetabular dysplasia with subluxation leads to early osteoarthritis. Simultaneously, acetabular dysplasia without subluxation also leads to osteoarthritis, but the osteoarthritic process may take decades to become evident (5). At present, radiography is always the initial examination in the diagnosis of adult acetabular dysplasia (6). Several radiological parameters, such as the center-edge angle (CE angle), Tönnis angle, and the femoral-head extrusion index (FHEI), have been utilized to diagnose adult acetabular dysplasia (1, 7, 8). Tönnis angle has been described with different terms in previous studies (1, 9-12), such as weight-bearing acetabular index, Lequesne’s acetabular index, acetabular roof obliquity and horizontal toit externe angle. It is one of the most common radiological parameters used to evaluate the adult hip. It measures the obliquity of the acetabular weight-bearing surface on a pelvic radiograph. A Tönnis angle larger than 13 degrees is considered to diagnose acetabular dysplasia (9). The acetabular weight-bearing surface is also called acetabular sourcil (1). 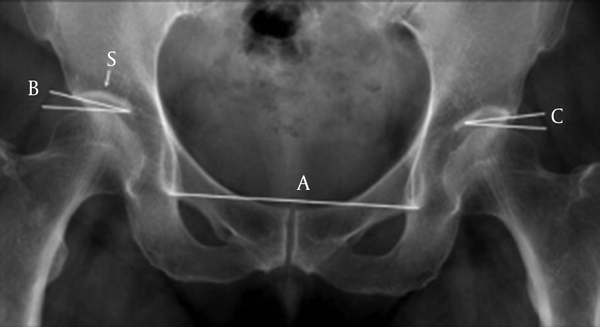 The medial-edge of the acetabular sourcil is utilized to measure the Tönnis angle. However, sometimes the sourcil’s medial-edge is not distinct (13), which causes inaccuracy or impossibility of Tönnis angle measurement. To solve this problem, the modified Tönnis angle was created as an improvement of the Tönnis angle (14). Modified Tönnis angle is a useful method, which can be used to diagnose dysplasia of the acetabulum. It was reported that a diagnosis of acetabular dysplasia in the adult could be made when a modified Tönnis angle was larger than 12 degrees (14). The value of modified Tönnis angle is not its superiority over other radiological parameters, but its role of an additional option for clinical applications, and it can sometimes replace Tönnis angle when the acetabular sourcil has a blurred medial-edge on the radiograph (14). However, it is important to evaluate the reliability of modified Tönnis angle as a new parameter. Apparently, if the modified Tönnis angle has poor repeatability of measurement, it will not be utilized in clinical applications. The purpose of this study was to evaluate the interobserver and intraobserver agreement of the measurement of Tönnis angle and modified Tönnis angle on radiographs in adults. Conventional anterior-posterior pelvic radiographs of patients were selected between December 2012 and February 2013, in The Second Hospital of Shandong University (Jinan, China). These pelvic radiographs of patients had to meet the criteria of Siebenrock et al. (15), including I. The end of the coccyges and the middle of the symphysis pubis should be arranged in a line and II. The distance between the sacrococcygeal joint and the symphysis pubis should be no more than 3.2 cm in men and 4.7 cm in women on radiographs. Exclusion criteria were joint space narrowing, hip joint dislocation, femoral head necrosis, fracture, tumor, and hip arthroplasty. 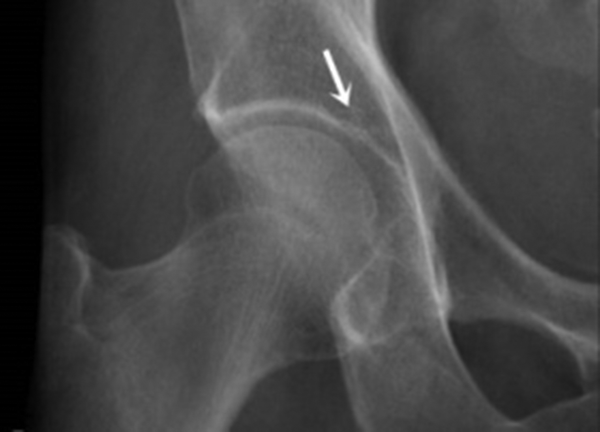 Hips with blurred medial-edges of acetabular sourcils (the weight-bearing portion of the acetabulum) on radiographs were also excluded (Figure 1). This study was approved by the ethics committee of The Second Hospital of Shandong University. Informed consent was acquired from every patient. Figure 1. Acetabular sourcil with blurred medial-edge on radiograph. The hips with this type of acetabular sourcils were excluded from this study. The pelvic horizontal plane was defined by a line linking the inferior edges of the teardrops on radiographs (Figure 2). To measure Tönnis angle, a line was confirmed first, linking the medial-edge of the acetabular sourcil and the lateral-edge of the acetabulum. The angle between this line and the pelvic horizontal plane (teardrop to teardrop) formed the Tönnis angle (Figure 2). Figure 2. Measurement of the acetabulum on radiograph. 1, Line A represents the horizontal plane of the pelvis, which links the inferior boundaries of the two teardrops on the radiograph; 2, Angle B shows the measurement of Tönnis angle. A line linking the medial-edge of the acetabular sourcil and the lateral-edge of the acetabulum was confirmed. The angle between this line and the pelvic horizontal plane forms Tönnis angle; 3, Angle C shows modified Tönnis angle. A line parallel to the pelvic horizontal plane and contact with the highest point of the femoral head was created. This line intersects the acetabulum at a point. Then another oblique line extending from this point to the lateral-edge of the acetabulum was drawn. The angle between these two lines represents the modified Tönnis angle; 4, S represents the acetabular sourcil with distinct medial-edge, which could be used to measure Tönnis angle. Modified Tönnis angle was measured as follows (14). First, a horizontal line, which was parallel to the pelvic horizontal plane (teardrop to teardrop) and contact with the highest point of the head of the femur was created. This horizontal line intersected the acetabulum on the radiograph at a point. Then, an oblique line linking this point and the acetabular lateral-edge was confirmed. The angle between these two lines represented modified Tönnis angle (Figure 2). All measurements were performed by two experienced observers, who independently measured Tönnis angle and modified Tönnis angle without communication. Each measurement was performed again after a month. Measurements were achieved by the tools of the Huahai MedPACS picture archiving communication system (Huahai Medical Info-Tech Co., Ltd., Xi'an, China). Interobserver and intraobserver agreement of Tönnis angle and modified Tönnis angle measurements were assessed using the tool of intraclass correlation coefficients (ICCs). This coefficient has values in the range of 0 to 1, and values larger than 0.75 indicate satisfactory reliability. Interobserver agreement of Tönnis angle and modified Tönnis angle measurements was further evaluated by the tool of Bland and Altman plot. In this plot, the X-axis showed the mean of the two values of one parameter which were measured separately by the two observers, and the Y-axis showed the difference between the two values. It can say that interobserver agreement is good if the mean difference is close to zero. All data were statistically analyzed by SPSS 18.0 for Windows (SPSS Inc., USA). The 95% confidence intervals (95% CIs) were computed. 142 patients including 79 females and 63 males were selected, and 284 hips on radiographs were acquired. Their age was 16 - 83 years old, and the average age was 47.6 years. Tönnis angle and modified Tönnis angle were separately measured twice by the two observers on radiographs of the 284 hips, and four sets of measurement data were obtained. ICCs indicated very good intraobserver agreement of radiographic parameter measurements, and all the values were larger than 0.960 for both the Tönnis angle and the modified Tönnis angle (Table 1). Abbreviations: ICC, intraclass correlation coefficient; 95%CI, 95% confidence interval. Interobserver agreement of radiographic parameter measurements was assessed by two methods. ICCs indicated very good interobserver agreement of measurements of Tönnis angle and modified Tönnis angle (Table 2). Furthermore, the Bland and Altman plot also indicated good interobserver agreement of Tönnis angle and modified Tönnis angle measurements (Figure 3), with the mean difference close to zero. Abbreviations: ICCs, intraclass correlation coefficient; 95%CI, 95% confidence interval. Figure 3. Bland-Altman plots. It was used to assess the interobserver agreement of Tönnis angle (A) and modified Tönnis angle (B) measurements. The X-axis shows the mean of the two values of one parameter which were measured separately by the two observers, and the Y-axis shows the difference between the two values. The solid line represents the mean difference and the two dotted lines represent the 95% confidence intervals. Bland and Altman plots suggest good reliability of Tönnis angle and modified Tönnis angle. It can say that interobserver agreement is good if the mean difference is close to zero. In our study, both ICCs and the Bland and Altman plot suggested good reliability of Tönnis angle and modified Tönnis angle. ICCs indicated very good reliability of Tönnis angle in our study, with values of 0.962 and 0.983 for intraobserver agreement of measurements, and 0.936 for interobserver agreement of measurements. In previous studies, the intraobserver and interobserver agreement of Tönnis angle measurements was reported to be satisfactory (16-19), and the data of the intraclass correlation coefficients (ICCs) ranged from 0.72 to 0.93 for intraobserver agreement and 0.82 to 0.90 for interobserver agreement. Obviously, the values of ICCs in our study are larger than the previous data. The main reason is the exclusion of acetabulums with blurred medial-edges of acetabular sourcils on radiographs. Blurred medial-edges of acetabular sourcils on radiographs can affect the accuracies of Tönnis angle (14), decrease the values of ICCs, and have negative effects on the reliability of Tönnis angle. The Bland and Altman plot suggested good interobserver reliability of Tönnis angle in our study, and this result is consistent with previous studies. In a previous study, the Bland and Altman plot method was used to evaluate interobserver reliability of different radiographic parameter measurements (16), and proved that Tönnis angle was also reproducible with a wider confidence interval. Modified Tönnis angle can also be used to diagnose acetabular dysplasia, and the correlation between Tönnis angle and modified Tönnis angle is also significant (14). However, there were no previous studies about reliability of modified Tönnis angle, and whether it is important to evaluate it. In our study, the Bland and Altman plot suggested good interobserver reliability of the modified Tönnis angle, and ICCs also indicated very good reliability of the modified Tönnis angle, with values of 0.971 and 0.984 for intraobserver agreement of measurements, and 0.936 for interobserver agreement of measurements. 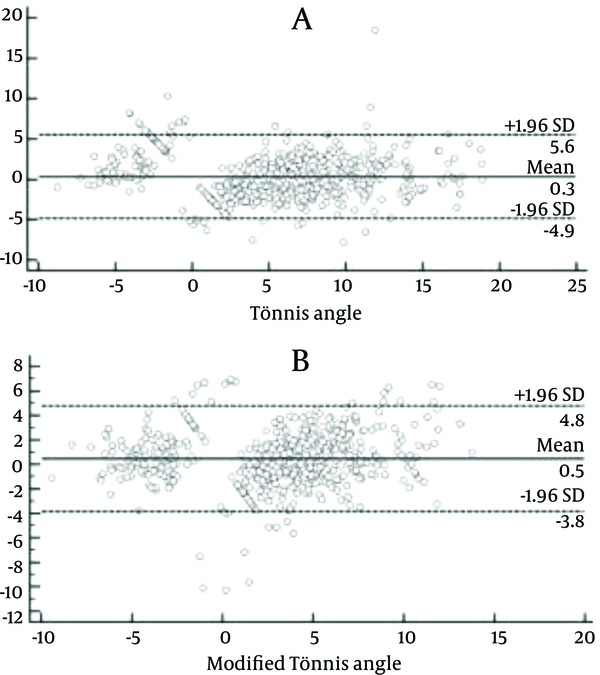 The values of ICCs for reliability of modified Tönnis angle were appreciably as large as Tönnis angle in our study, partly because the measurement of the modified Tönnis angle is simple and explicit on radiographs. Particularly, joint space narrowing (JSN) and subluxation of the hips were excluded, which could improve the reliability of modified Tönnis angle in our study. Joint space narrowing and hip joint dislocation can cause inaccuracy of modified Tönnis angle, and adversely affect the measurement reliability. In conclusion, modified Tönnis angle is a new parameter for radiographic evaluation of acetabular dysplasia, and has fewer adverse factors that can affect the reliability. In our study, there were very good intraobserver and interobserver agreement of Tönnis angle and modified Tönnis angle measurements. Some adverse factors that may affect the agreement of measurements were excluded, so the values of ICCs in our study are larger than the previous data. Obviously, modified Tönnis angle is a reliable parameter, and may play a more important role in adult acetabular dysplasia diagnosis. This study was supported by youth fund of the second hospital of Shandong University (Grant no. Y2014010042). I gratefully acknowledge the help of Shai Ma, Feixue Zhang, and Suhong Zhao in the course of this study. Thanks to Dr. Edward C. Mignot, Shandong University, for linguistic advice. Disclosure of Interest: The authors declare that they have no competing interest. 1. Beltran LS, Rosenberg ZS, Mayo JD, De Tuesta MD, Martin O, Neto LP, et al. Imaging evaluation of developmental hip dysplasia in the young adult. AJR Am J Roentgenol. 2013;200(5):1077-88. doi: 10.2214/AJR.12.9360. [PubMed: 23617493]. 2. Angliss R, Fujii G, Pickvance E, Wainwright AM, Benson MK. Surgical treatment of late developmental displacement of the hip. Results after 33 years. J Bone Joint Surg Br. 2005;87(3):384-94. [PubMed: 15773651]. 3. Wedge JH, Wasylenko MJ. The natural history of congenital disease of the hip. J Bone Joint Surg Br. 1979;61-B(3):334-8. [PubMed: 158025]. 4. Murphy SB, Ganz R, Muller ME. The prognosis in untreated dysplasia of the hip. A study of radiographic factors that predict the outcome. J Bone Joint Surg Am. 1995;77(7):985-9. [PubMed: 7608241]. 5. Cooperman DR, Wallensten R, Stulberg SD. Acetabular dysplasia in the adult. Clin Orthop Relat Res. 1983;(175):79-85. [PubMed: 6839611]. 6. Chiamil SM, Abarca CA. Imaging of the hip: a systematic approach to the young adult hip. Muscles Ligaments Tendons J. 2016;6(3):265-80. doi: 10.11138/mltj/2016.6.3.265. [PubMed: 28066731]. 7. Pereira F, Giles A, Wood G, Board TN. Recognition of minor adult hip dysplasia: which anatomical indices are important? Hip Int. 2014;24(2):175-9. doi: 10.5301/hipint.5000119. [PubMed: 24474411]. 8. Anderson LA, Gililland J, Pelt C, Linford S, Stoddard GJ, Peters CL. Center edge angle measurement for hip preservation surgery: technique and caveats. Orthopedics. 2011;34(2):86. doi: 10.3928/01477447-20101221-17. [PubMed: 21323284]. 9. Lequesne M. [Coxometry. Measurement of the Basic Angles of the Adult Radiographic Hip by a Combined Protractor]. Rev Rhum Mal Osteoartic. 1963;30:479-85. [PubMed: 14088029]. 10. Tönnis D. Congenital Dysplasia and Dislocation of the Hip in Children and Adults. The C.V. Mosby Company; 1978. 11. Laborie LB, Engesaeter IO, Lehmann TG, Sera F, Dezateux C, Engesaeter LB, et al. Radiographic measurements of hip dysplasia at skeletal maturity--new reference intervals based on 2,038 19-year-old Norwegians. Skeletal Radiol. 2013;42(7):925-35. doi: 10.1007/s00256-013-1574-y. [PubMed: 23354528]. 12. Werner CM, Copeland CE, Ruckstuhl T, Stromberg J, Turen CH, Bouaicha S. Relationship between Wiberg's lateral center edge angle, Lequesne's acetabular index, and medial acetabular bone stock. Skeletal Radiol. 2011;40(11):1435-9. doi: 10.1007/s00256-011-1141-3. [PubMed: 21404052]. 13. Brannon JK. Hip arthroscopy: intra-articular saucerization of the acetabular cotyloid fossa. Orthopedics. 2012;35(2):e262-6. doi: 10.3928/01477447-20120123-23. [PubMed: 22310417]. 14. Fa L, Wang Q, Ma X. Superiority of the modified Tonnis angle over the Tonnis angle in the radiographic diagnosis of acetabular dysplasia. Exp Ther Med. 2014;8(6):1934-8. doi: 10.3892/etm.2014.2009. [PubMed: 25371759]. 15. Siebenrock KA, Kalbermatten DF, Ganz R. Effect of pelvic tilt on acetabular retroversion: a study of pelves from cadavers. Clin Orthop Relat Res. 2003;(407):241-8. [PubMed: 12567152]. 16. Bouttier R, Morvan J, Mazieres B, Rat AC, Ziegler LE, Fardellone P, et al. Reproducibility of radiographic hip measurements in adults. Joint Bone Spine. 2013;80(1):52-6. doi: 10.1016/j.jbspin.2012.02.002. [PubMed: 22445554]. 17. Yoshimura N, Campbell L, Hashimoto T, Kinoshita H, Okayasu T, Wilman C, et al. Acetabular dysplasia and hip osteoarthritis in Britain and Japan. Br J Rheumatol. 1998;37(11):1193-7. [PubMed: 9851268]. 18. Carlisle JC, Zebala LP, Shia DS, Hunt D, Morgan PM, Prather H, et al. Reliability of various observers in determining common radiographic parameters of adult hip structural anatomy. Iowa Orthop J. 2011;31:52-8. [PubMed: 22096420]. 19. Nelitz M, Guenther KP, Gunkel S, Puhl W. Reliability of radiological measurements in the assessment of hip dysplasia in adults. Br J Radiol. 1999;72(856):331-4. doi: 10.1259/bjr.72.856.10474491. [PubMed: 10474491].